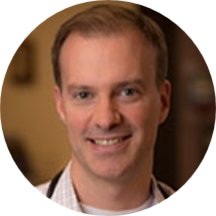 Dr. James Mockler is a family medicine physician in Lafayette. He is originally from Omaha, Nebraska, and his studies and work have taken him across the United States. He received a master's degree in public health from George Washington University in Washington D.C. and a medical degree from the University of Nebraska Medical Center in Omaha. He is board certified in family medicine. Dr. Mockler completed residency training at Valley Family Medicine in Renton, Washington. He then began working at community health centers in both Denver and Loveland, Colorado. Dr. Mockler met his wife when they both attended George Washington University's master's program in public health. Both are dedicated to improving health in a variety of settings with their work at community health centers, private practices and public health agencies. When not seeing patients, Dr. Mockler enjoys playing tennis, biking, hiking and skiing. "I went into family medicine to care for patients of all ages – from newborns to the elderly. Family medicine allows me to provide a continuity of care for my patients and I enjoy seeing them improve their health throughout the course of our relationship." Very thorough- caring & reassuring- gave us 2 options- good discussion. Good bedside manners, friendly, and he listens. Dr. Mockler is more patient than most doctors I've seen.